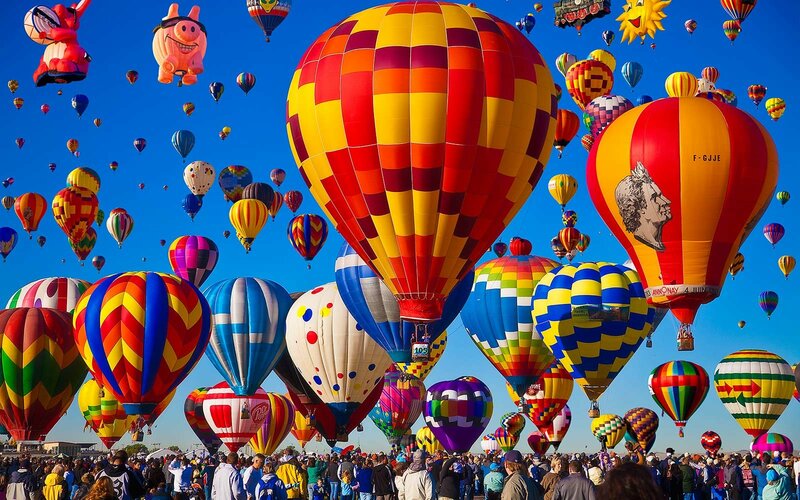 Santa Fe’s #1 Outdoor Activity on TripAdvisor Welcomes Pilots, Crews and Spectators to the 45th Annual Albuquerque International Balloon Fiesta! Great Time on the Rio Grande! A Grand Adventure Down the Rio! Great staff and great experience! Great water, great scenery, great guides! …And Rafting in the Afternoon! 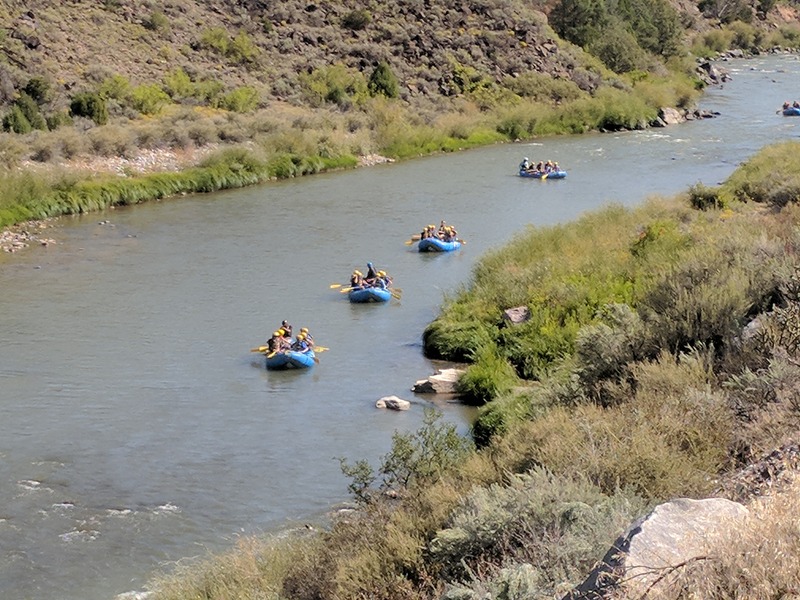 Kokopelli Rafting Adventures has extended our season for a special Balloon Fiesta Whitewater Rafting trip. What a great way to see New Mexico — From the air in the morning and the water in the afternoon! 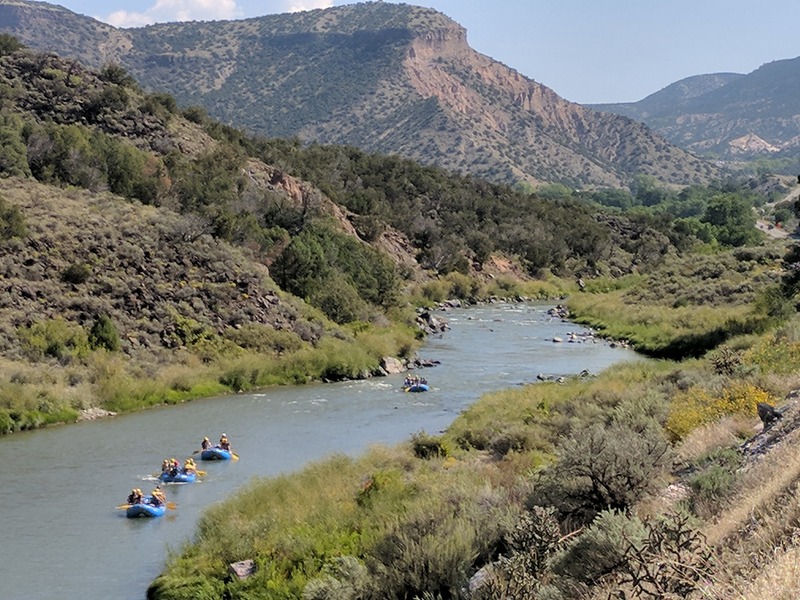 See why we call New Mexico “The Land of Enchantment!” as our interpretive river guides share the history, geology and excitement of a special segment of the Rio Grande in the heart of the Rio Grande del Norte National Monument. Trips offered daily from Oct 7 – 15. Limited Availability each day. Advanced registration required. Meeting time is 11:45am in our Santa Fe office. $120/adult and $100/child 12 and under. Groups of 12 or less save 5% when registering online and paying via PayPal! Register early to ensure availability! Round-trip transportation from Santa Fe! Let us do the driving while you rest and enjoy the interpretive tour from our professional guides! Your choice of beef, chicken or vegetarian (been and veggies), chips & Salsa, pralines, snack bars and more! 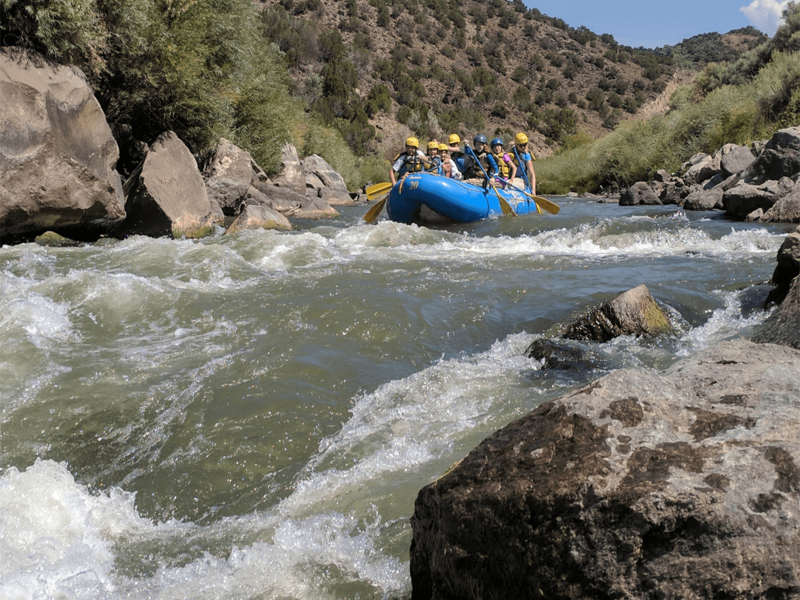 The five-mile Racecourse rafting trip is our most popular half-day trip on the Rio Grande, ranging from a wild class III+ ride during the spring high-water to a more technically-demanding tight, twisty run as the water goes down in late Summer and early Fall. For the Balloon Fiesta Whitewater Special, you will have an active role in paddling your raft through notable rapids including Albert’s Falls (named after Albert Einstein), Big Rock Rapid (formed by a 100-ton boulder in the early 1990s), the famous surfing wave Sleeping Beauty and the short, sweet and steep Souse Hole. Your private guide will be depending on you to help maneuver the raft through many tight slots. In addition, the water warms up and there is more opportunity for warm-water fun, such as swimming and boat surfing. 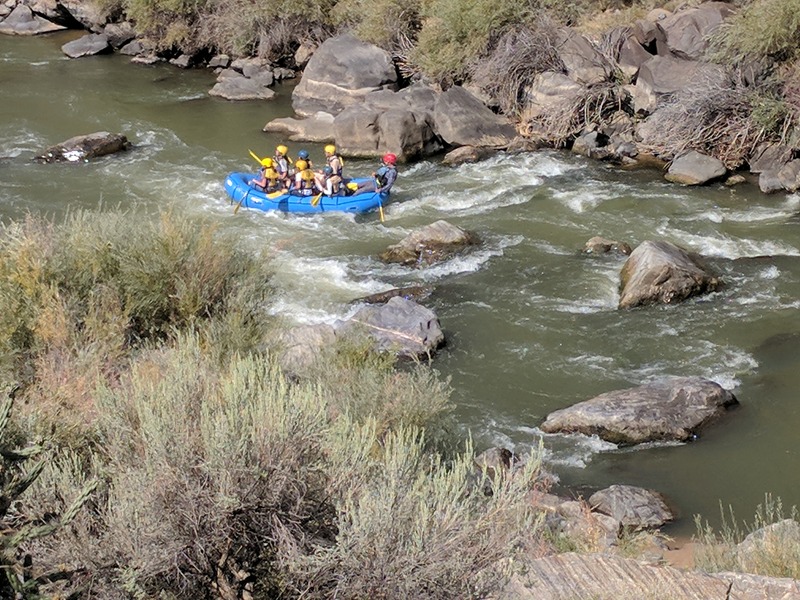 The moderate Rapids of the Racecourse rafting trip is a great trip for beginning whitewater participants, as well as experienced rafters looking for a quick adrenaline fix, or anyone who loves the river and the outdoors. 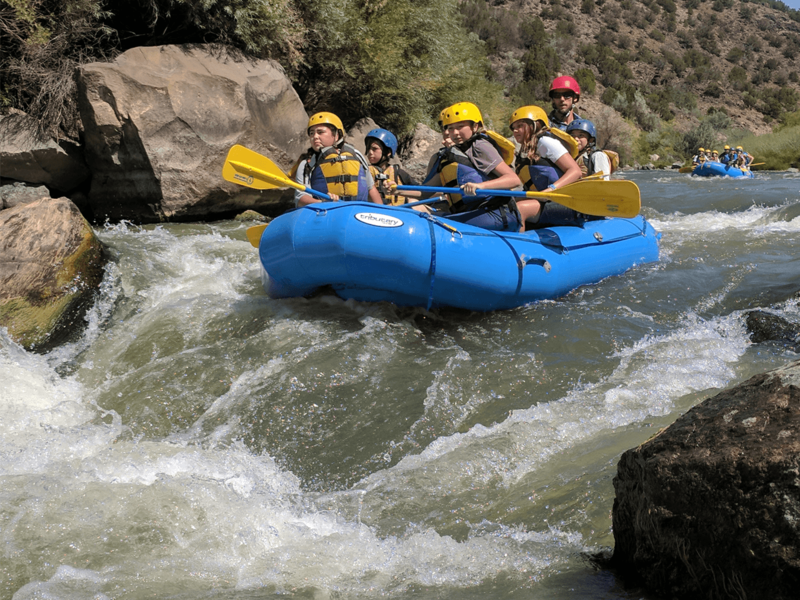 The minimum age is seven, although Kokopelli Rafting Adventures reserves the right to raise the age limit during extremely high water. The Racecourse rafting trip is our most popular option for families and large groups with varied group experience levels. Everyone has a great time on the river trip, and its not too intimidating for first timers especially at late Summer flows. Price: $120/adult and $100/child 12 and under. Participant Requirements: Must be in generally good physical fitness, have the ability to brace yourself inside the raft, and paddle periodically as requested by the guide. Must be age 7 and up. How many people will be in each raft? 5 is typical, but it all depends on several variables, including the volume of water in the river, the size of each participant and the size of each group. Can my party of 7 be in the same raft? We’ll make every attempt to group participants in the same party together, however, please understand that the heavier the raft is, the more difficult it will be to maneuver around or over river features. KRA reserves the right to divide parties of 5 or more into smaller groups and/or place multiple smaller parties in the same raft, unless a private raft is requested. We want our own private raft. How can we book that? In order to book your own private raft, you would need to purchase all 5 spots in the raft at the full adult rate. You will meet at the Kokopelli Rafting Adventures world headquarters in Santa Fe, New Mexico. Directions to our office will be sent via email in your trip confirmation. What time do you meet and how long will the trip last? Your party will meet us in Santa Fe at 11:45am. We will drive about 1-hour north to the Rio Grande del Norte National Monument and begin your trip at 1pm. You should return back to Santa Fe before 6pm, leaving time for the Balloon Fiesta evening events in most cases. How far is your office from Balloon Fiesta Park? 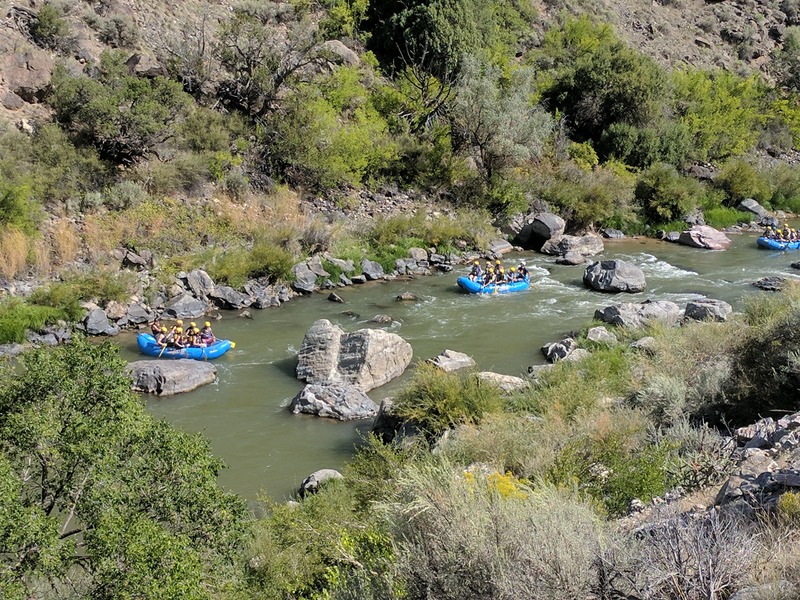 Under normal driving conditions (no traffic), Kokopelli Rafting Adventures is 55 minutes from Balloon Fiesta Park. Please allow additional time for Balloon Fiesta traffic. What is the weather like in October? Average temperatures for Northern New Mexico in October can range from the 60s to the 90s, with higher and lower extremes. Our rafting trips take place in the middle of the day to maximize direct sunlight. Do you provide any extra equipment? Yes, we provide all rafting equipment, such as the raft, paddles, high-flotation personal flotation devices and helmets. 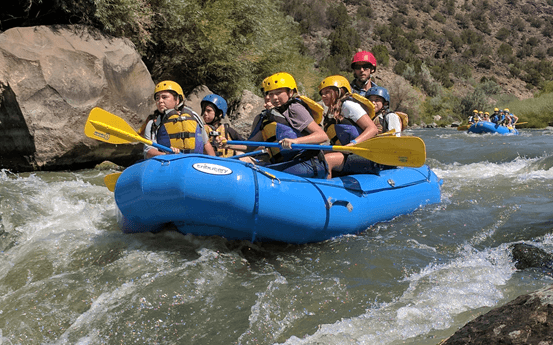 In the unlikely event the combined air and water temperatures are below 100 degrees, Kokopelli Rafting will provide additional layers, including wetsuits, fleece and splash jackets. What is the water level like in October? The Rio Grande Racecourse is runnable in a raft at levels above 185cfs. Average flows for October are between 250-400cfs. What is the character of the river like? There are about a dozen class II rapids and a half-dozen class III rapids, and pools of flat, calm water in between. Class III is considered intermediate skill levels, however, with a competent guide, class III are generally suitable for novice paddlers. Safety is important to me. 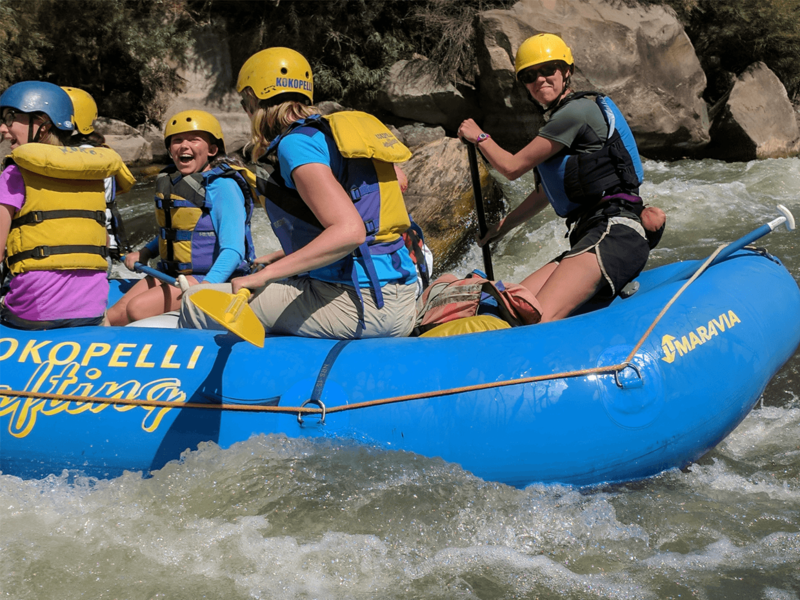 What sets Kokopelli Rafting Adventures apart? Safety, service and professionalism is what sets Kokopelli apart. At Kokopelli, we actively recruit outdoor professionals to join our team. Then we train them well above industry standards. And we continue to offer training in related courses including swiftwater rescue, wilderness first aid, whitewater kayaking, stand-up paddleboarding, and more. You won’t find a shirtless guide on a Kokopelli raft. We don’t have to worry about our guides hitting on guest or smelling like pot. All our guides know they may be drug tested in a moment’s notice, but it doesn’t matter to them because it’s not a part of their lifestyle. Kokopelli guides pursue excellence in everything they do, so continuous ongoing training is a welcomed opportunity, not a financial burden or disruption to employment. Currently, every Kokopelli Guide has, or is working on a 4-year degree. They are professionals in every sense. What credentials do your guides have? Unlike other states, New Mexico does not have a river guide standard, and requires only 3 documented training runs. Since Kokopelli has operated in the state of Colorado, our training is designed to meet Colorado’s exceptionally high standards. All Kokopelli guides go through an 8 day, 80-hour guide training school, and a final checkout run, which often requires an additional 10-40 hours before passing a check-out run. Most outfitters in New Mexico offer a 3-day guide training program. 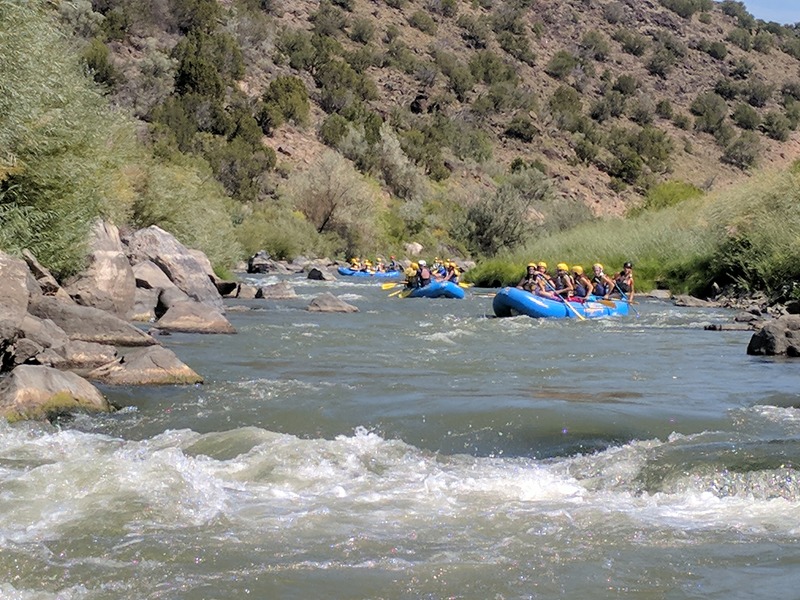 At Kokopelli, we believe it takes a good 4 days (or 40 hours) of structured training to become a good student of whitewater rafting, and an additional 4 days (or 40 hours) to develop those skills into leadership potential. Our average tenure at Kokopelli is 6 years, so first year guides are constantly mentored by experienced guides for continual skills development and improvement of our guests’ experiences. How often do you replace your life jackets? Kokopelli replaces life jackets at the end of their 3rd season, and uses “high flotation” life jackets with 25lbs of flotation; industry standard life jackets have 16lbs of flotation. A life jacket loses 25% of its flotation each year. By the time it is 4 years old, if has virtually no flotation left to it. By the time a life jacket has faded from red to pink, or black to gray, it is likely 8 or more years old and well past it’s usable life. You won’t find a faded life jacket on a Kokopelli Rafting trip! Kokopelli was the first company to require helmets on the Racecourse, starting in 1996, and still one of the only companies to require helmets today. Participants are more likely to be injured by another participant’s paddle than by rocks in the river. Do your rafts have a perimeter line? A perimeter line is one of the most under-utilized pieces of safety equipment and few companies in our industry use them. It’s a length of rope lining the outside perimeter of the raft and helps swimmers grab ahold of the raft while re-entering the raft. Imagine trying to climb into a wet, slippery raft in aerated whitewater with nothing to hold on to. 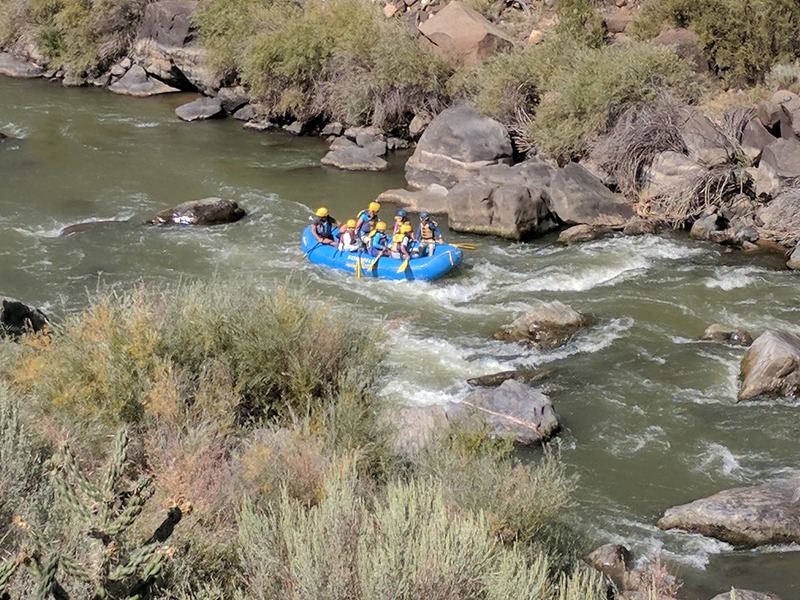 While not required in New Mexico, all Kokopelli rafts have a perimeter line around the full length of the raft so a swimmer can grab ahold of it from any location.